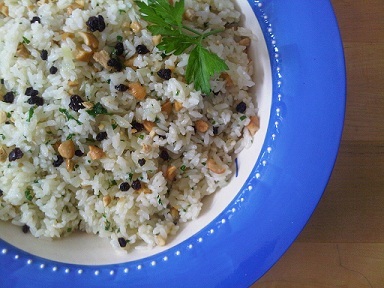 Easy 30 minute recipes for weekday cooking - Blog - Hot-Cooked Rice? So nice! You might think that rice is in my blood, in my veins. But you would be wrong. As a kid, I was a mashed potatoes girl. And it’s only as I developed an appreciation of food and cooking that I learned to appreciate rice – the firm little morsels with just a little bite, that when chewed slowly, develop a sweetness that fills the mouth with flavor. I don’t understand why more people don’t have a rice cooker. It’s one of the cheapest electrical food appliances and proves its worth every time I have perfect rice in 30 minutes by just pressing a button – no watching, no fussing. If you’re in a hurry to put dinner on the table after work, you can start rice in the rice cooker as soon as you get home. Now you can tend to the meat and veggies. It’s great for company, too, since it’s the one part of the meal that makes itself. I’ll give you a way to dress up plain rice for a company dinner in my reci-tips below. There are fancy rice cookers that program for the type of rice you are using. Some have induction heating, inner pans made of clay, and other bells and whistles. But I’m perfectly happy with my no-nonsense, inexpensive National. If you cook a variety of rice often – brown, jasmine, basmati, etc. – you might want a more sophisticated rice cooker, but for basic long grain and short-grain rice, the simplest will do. Along with a rice cooker, no Asian family would be without a rice paddle. Flat and oval-shaped, it’s more convenient than a spoon for fluffing just-cooked rice and for scooping it out of the pot. Mock Rice Pilaf: Cook 3 cups long- or short-grain rice using lower-sodium chicken broth instead of water. Just before rice is done, melt ¼ cup butter in a pan on medium heat and saute ½ cup minced onion just until onion is soft. Stir in ¼ cup chopped flat-leaf parsley, 1/3 cup chopped roasted cashews and ¼ cup currants. Spoon butter mixture into hot rice and toss to coat. Makes 8 to 12 servings. You can halve this recipe, vary the herbs and nuts, and play with the amounts to suit your taste. Fried Rice: In a wok or large nonstick skillet, stir-fry chopped bacon until crisp; remove bacon and drain fat. Heat vegetable oil in the same pan and stir-fry veggies such as broccoli or cauliflower florets, bias cut celery, carrots, asparagus, chopped or sliced onion – whatever you have on hand – until crisp-tender; very lightly season with salt. Remove veggies. Heat more vegetable oil in the same pan and add leftover cooked rice (you’ll have to crumble rice with clean hands if it has been refrigerated because rice will clump together), tossing until grains are heated through. Return bacon and veggies to the pan and season with soy sauce, a combination of soy sauce and oyster sauce, a combination of soy sauce and fish sauce, or just salt and pepper. Garnish with chopped green onion or cilantro. Instead of bacon, you can use leftover strips of ham, steak, roast chicken or cooked shrimp. Summer Rice Salad: Combine chilled rice with chopped veggies, such as zucchini, green onions, minced onion, halved cherry tomatoes, drained marinated artichoke hearts, diced cucumber, diced red or green pepper, sliced pitted olives. plus chopped herbs like flat-leaf parsley or basil, Toss with vinaigrette. To make a main dish salad, add drained can tuna and chopped hard-cooked eggs. Special Fork is a recipe website for your smartphone and PC that solves the daily dinnertime dilemma: what to cook now! Our bloggers blog Monday through Friday to give you cooking inspiration. Check out our recipe database for quick ideas that take no more than 30 minutes of prep time. Join the conversation on Facebook and follow us on Twitter. Electric rice cookers are very helpful for busy people, specially when both parents work and do not have the time to cook. Using one of these cookers means one thing less to watch on the kitchen.